Of all Mallorca’s courses, Golf de Son Termens is probably the one that is best integrated into the stunning natural environment. It was opened in May 1998 and designed by The Harris Group and José Rodriguez. 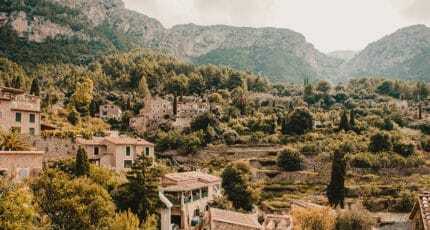 It’s situated only 10km from Palma de Mallorca, near Bunyola, on an old hunting estate in the foothills of the Serra de Tramuntana (the mountain range designated a UNESCO World Heritage Site in 2011). It’s a sloping course with views of the bay of Palma and surrounding spectacular countryside. This is a challenging and tight course that becomes increasingly tougher as you progress. The first is a short par 4 (229 metres), but the second is more difficult. It has some tiny greens and what have been described as rollercoaster fairways. There are back-to-back par 5s on five and six, but no par 5 holes on the back nine. The only building you’ll see is the Mallorcan-style clubhouse, home of the restaurant and café, with terraces overlooking the whole beautiful course, and a golf shop. You can hire golf buggies, carts and clubs here. And you might need to buy a few new balls to replace those you could potentially lose playing here! We hope you have found this article about the Golf de Son Termens useful and that you have many memorable stays in Mallorca as a result of our recommendations.